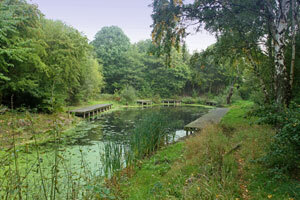 Please note: From June 2018 onwards Penketh & Old Hall Angling Society will relinquish fishing rights to Whitegate Pool and our club and members will have no access to this water. Thinking of fishing on Whitegate today, not sure of the weather, click on the image alongside to see results from our local weather station. Updated every ten minutes, it'll give you a good idea of what to expect. Whitegate Pool had additional platforms erected in 2005. There are 12 Pegs available and fishing is from platforms only. No night fishing, members only, no day tickets. Limited parking is available in Livingstone Close (Please respect our neighbours when parking vehicles). 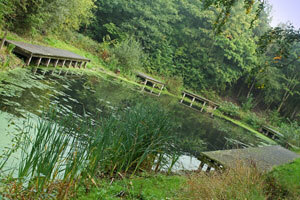 Fish Include: Roach, Rudd, Gudgeon, Perch, Tench, Crucian, Common & Mirror Carp. During the Summer of 2013 a digger was used to remove many of the lily roots which had taken over in recent years and has improved fishing for our members, along with some landscaping work carried out earlier in the year. This pool doesn't get fished as much as our Brownlee's Pool, so if you get chance, give it a go, the fish are less cautious and love a good maggot or piece of sweetcorn. - YOU HAVE TO BE A CLUB MEMBER OF COURSE!